Our 188 campsites are spaciously arranged throughout natural woodlands and are surrounded by many comforts of home including, electrical and water hookups, heated showers and flush toilets, paved roadways and parking pads, picnic tables, grills and playgrounds, laundry facilities, a camper store for food and supplies, 24-hour security throughout the Park, and a centralized sewage disposal station, to name a few. The Campground also boasts two youth group sites and a Boy Scout Primitive Area. Campers and outdoor enthusiasts find Newport News Park a perfect retreat for hiking or bicycling on the Park’s many trails; picnicking in shelters with outdoor grills; geocaching; fishing, boating and canoeing on the Park’s scenic lakes and inlets; and enjoying sports such as disc golf, archery, and golf. 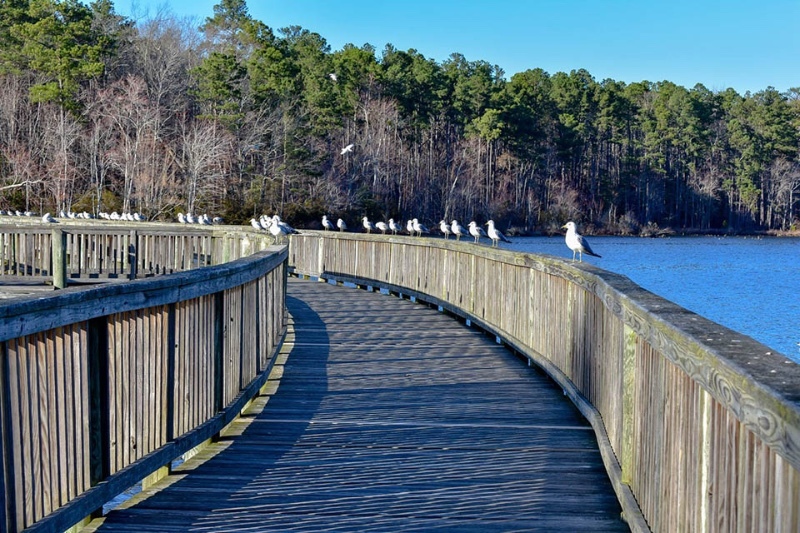 The Park, located between Richmond and Virginia Beach, is ideally situated in an area rich in historical attractions, theme parks, museums and entertainment.